The Uniden BearCat BC365CRS Scanner is a full featured analog scanner that can store up to 500 channels. If your locale is using traditional radio analog systems the BC365CRS will pick up signals within a 20-40 mile radius. The BearCat BC346CRS scanner is the perfect addition to any bedside table, great room, kitchen, and other locations within your home or office. The sharp LCD display shines brightly at night making the unit readable at a glance. Keep track of the latest local or community public safety, weather, news, and emergency broadcasts in your area. The BC365CRS is a multifunctional base unit that integrates an AM/FM radio, alarm clock, and NOAA weather radio into an easy to use radio scanner. The BearCat BC365CRS scanner has been configured by Uniden so that you won't have to worry about accidentally tuning into FCC restricted frequencies. You won't be able to listen in on your neighbors cellular telephone calls, but you will be able to receive AM, FM, VHF, and HF frequencies. The ability to listen to police, sheriff, fire, marine, amateur radio, railroad, business, industrial, and broadcast stations is available across 13 bands all at your fingertips on the BC365CRS. The BC365CRS scanner is capable of scanning 90 channels per second so you won't miss any of the action. Save up to 500 channels in 10 banks on this BearCat radio scanner and you won't have to manually enter frequencies. Five service searches allow easy scanning of bands that are common for Police, Fire/EMS, Aircraft, Amateur Radio, and Marine radio traffic. Combined with the weather alert scan your BC365CS will keep you on top of the latest happenings locally and regionally in real time. The BC365CRS can be used with an optional 32 ohm stereo headset or earphone. This makes for quiet listening when having the volume turned up might disturb others. An earphone is a great option when you want to monitor EMS radio traffic while doing other important work or even watching TV. The memory of the BC365CRS is protected by battery backup mode, which requires 3 AA Alkaline batteries that are not included with the BearCat scanner. 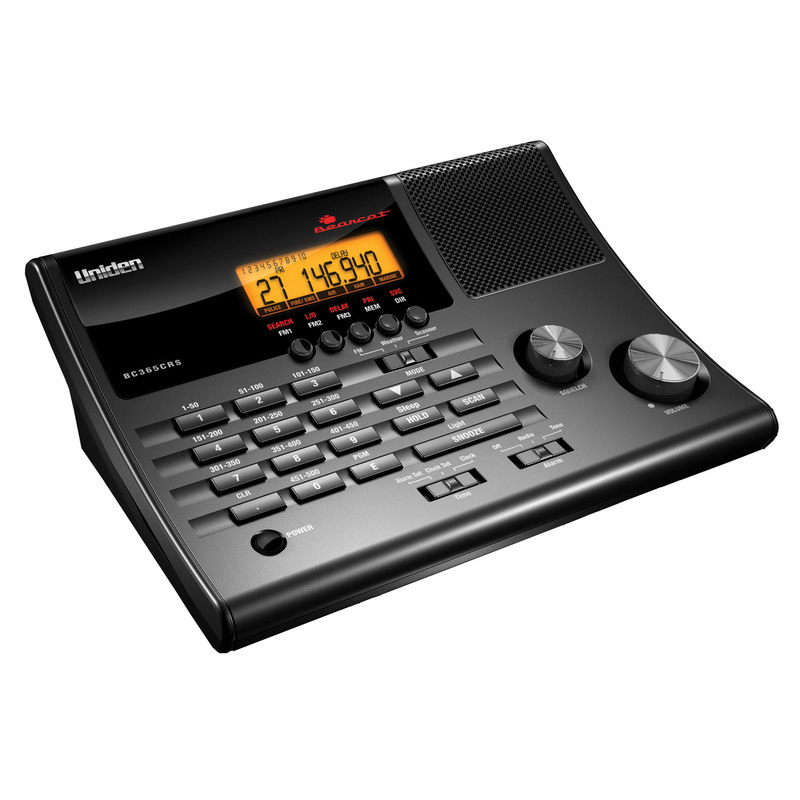 Be ready by staying informed of the latest news and emergencies in your neighborhood with a BearCat BC365CRS radio scanner by Uniden.